In 1963 the Lunar and Planetary Lab published the Rectified Lunar Atlas which showed what the limb regions of the Moon looked like with most of the distortions due to extreme foreshortening removed. That required projecting a terrestrial image of a lunar limb region onto a large white globe and re-photographing it from a position above the limb. Now, amateurs can use software - in this case, PlanetWarp - to digitally cancel foreshortening. Probably all limb images should be rectified to improve our ability to interpret the surface. Let's see what we can observe on Kostas' image acquired during a recent favorable libration. First, orient yourself. The South Pole is at the bottom right of the image, and Newton and its cascade of lettered craters are near top right. 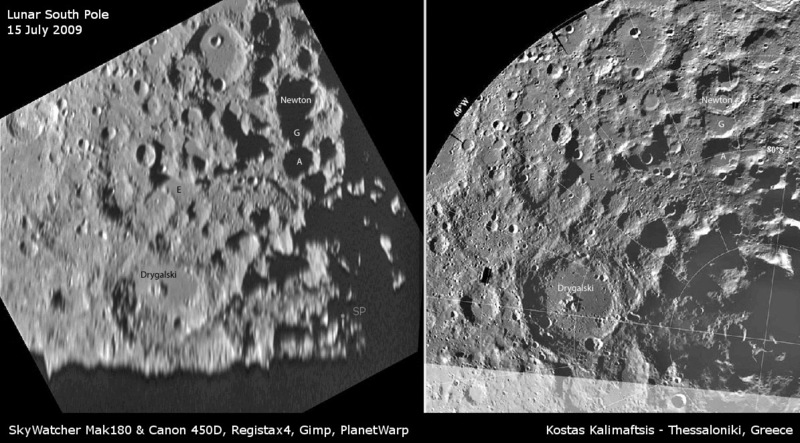 The rectification process exaggerates the limbward walls of craters near the image edge - notice the unequal widths of Drygalski's walls. To the southwest of Newton A the Sun angle of Kostas' image reveals a secondary crater chain or some other type of linear depression that doesn't show up at all in the Clementine mosaic. And both images also document the strange smooth area named Casatus E, near the middle of the scene. Since there is no spectral evidence for volcanism this far south, presumably this patch, like the floor of Newton G and other craters is veneered with ejecta from the formation of the Orientale Basin. July 15th 2009, 03.00 UT. SkyWatcher Mak180 & Canon 450D, 1.6x barlow, 17 jpegs on Registax, edited on Gimp. Rectified with PlanetWarp.